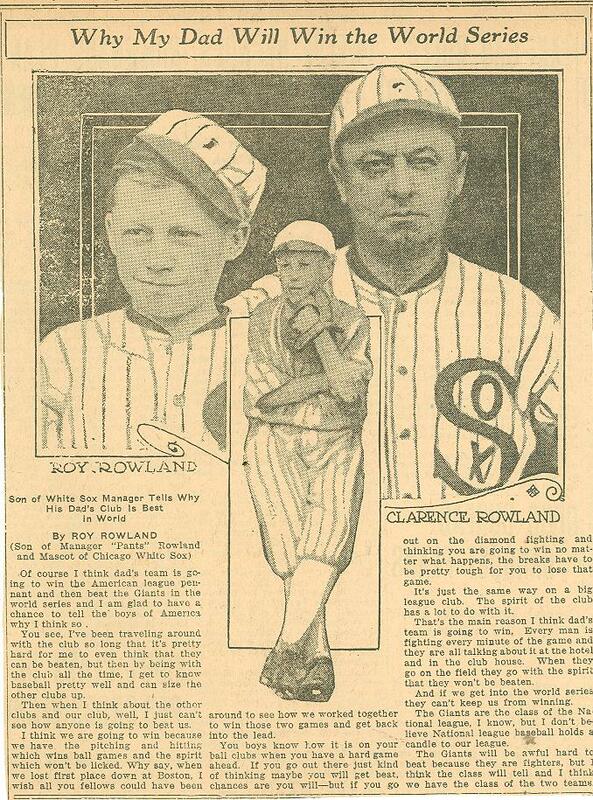 Son of White Sox Manager, "Pants" Rowland. 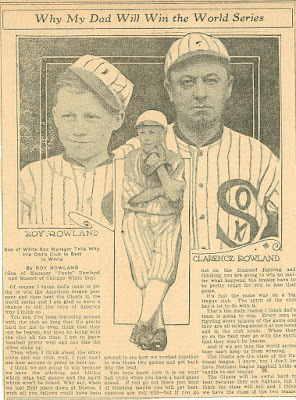 Of course I think dad's team is going to win the American league pennant and then beat the Giant's in the World Series and I am glad to have a chance to tell the boys of America why I think so. You see, I've been traveling around with the club so long that it's pretty hard for me to even think that they can be beaten, but then by being with the club all the time, I get to know baseball pretty well and can size the other clubs up. Then what I think about the other clubs and our club, well, I just cant see how anyone is going to beat us. I think we are going to win because we have the pitching and hitting which wins ball games and the spirit which won't be licked. Why say, when we lost the first place at Boston, I wish all you fellows could have been around to see how we worked together to win those two games and get back into the lead. You boys know how it is on your ball clubs when you have a hard game ahead. If you go out there just kind of thinking maybe you will get beat, chances are you will - but if you go out on the diamond fighting and thinking you are going to win no matter what happens, the breaks have to be pretty tough for you to lose that game. It's just the same way on a big league club. The spirit of the club has a lot to do with it. That's the main reason I think dad's team is going to win. Every man is fighting every minute of the game and they are all talking about it at the hotel and in the club house. When they go on the field they go with the spirit that they won't be beaten. And if we get into the World Series they can't keep us from winning. The Giant's are the class of the National league, I know, but I don't believe National league baseball holds a candle to our league. The Giant's will be awful hard to beat because they are fighters, but I think the class will tell and I think we have the class of two teams. From the Rock Island Daily Union. August 20, 1917.